These spectacular double flowering tulips are also know as 'Peony Tulips' for the close resemblance that their sweetly scented, blousy blooms bear to that early summer favourite. They'll bloom from April, through May, bringing a dramatic splash of colour to your garden and filling the air with delightful perfume. Tulips are perfecting for planting in a mix of colours, shapes and sizes, contrastingly beautifully against one-another so plant them en masse in borders for a wave of colour - or group in containers for a superb formal springtime display. 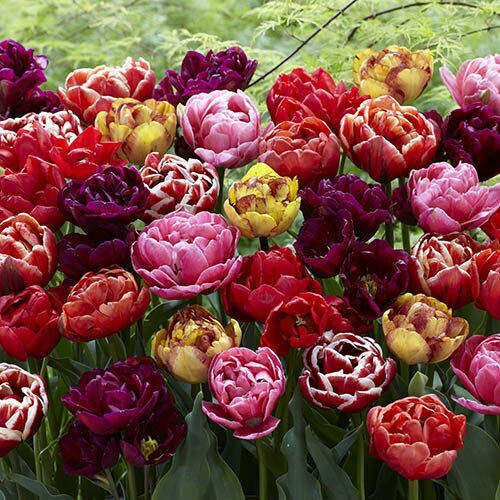 This mix is of double blooming tulips is perfect for an easy solution to filling up gaps in beds and borders or spare pots and containers. Simply plant the bulbs out and watch as they're erupt into colour next spring - great for beginners! Supplied as a mix of 20 bulbs, size 11/12.